Since 2006, NCK’s pedagogical prize has been awarded annually to any person or institution that has made outstanding contributions to the field of heritage learning in the Nordic/Baltic region. NCK’s board goes through the nominations during November and appoints the awardee who is contacted in late November/early December. The prize is awarded during NCK’s spring conference, when the name of the awardee is revealed. 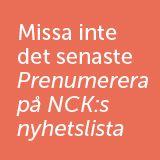 The prize is distributed as a grant of 25 000 SEK and the awardee is invited to hold a lecture at the next NCK’s Spring conference. You can now nominate your candidate for the 2019 NCK’s pedagogical prize. Last day to send in your nomination is November 19, 2018.